We all (hopefully) know about the destruction of Faerieland as a result of Xandra’s selfish act to turn all the faeries to stone. Only a few months ago, Faerieland was in tatters, both in physical and mental state. After all, the faeries had lost nearly everything--their buildings, the joy of bouncing around in the clouds, even their fair skin had become flaky after spending so much time as stone figures. Yet now, as I walk along the streets of Faerie City, the air is alive with joy and hope. The buildings have all been rebuilt--and not just hastily put back together. No, the entire city has been remodelled to a point where it is actually more beautiful than it was before it fell from the sky. Everything is better than ever in Faerie City, and it couldn’t have been so without the support and leadership of the Faerie Queen, Fyora. Queen Fyora is a determined, powerful figure that would never stop at anything in order to reach what she feels is right. When other faeries could only moan and weep at the condition of their beloved land, Fyora took up her natural leadership and introduced to Faerieland a new system--a system where working together was essential to fulfil goals. Faeries were expected to aid in ridding the area of rubble and other things that were now useless. After everything unwanted had gone, the building could begin. Fyora saw that the faeries alone might not be able to complete such a tedious process, so she arranged a large construction project where Neopians were able to bring the faeries needed supplies in return for rewards. Soon, the whole of Neopia was involved in the well being of Faerie City. Her Highness also helped fund the costs by contributing money earned from the Hidden Tower to rebuild Faerieland. Other faeries soon followed suit, and neopoints from the Wheel of Excitement, the Faerieland Bookstore, and other Faerie shops were able to generate needed money. Now, Faerieland is almost completely recovered, and it is all thanks to the leadership of the Faerie Queen. I was lucky enough to secure a meeting with the Faerie Queen in the Hidden Tower. After I promised to someday buy a Sword of Lameness (“For the good of Faerieland!”), she agreed to answer my questions. Your Majesty, it is simply an honor... let me start by asking, what is your secret to being such a powerful and influential leader? There’s no secret; I simply lead and others follow. Of course, it does help having been in power for hundreds of years. The other faeries follow their elders, and I am one of the oldest faeries in the land. What, in your personal opinion, makes you different from the other faeries? Simply my personal experience. Locking away the Darkest Faerie for ten centuries is no small deed. Leading the faeries and rebuilding Faerieland was simply a walk in Neopia Central after that. Will you ever have a successor? Well, eventually. I can’t last forever... although I can try. Faeries do live an extremely long time, you know. Why are your prices in the Hidden Tower so high? They are ancient faerie artifacts. And they could only be reasonable for the joys that they bring to Neopians. Truthfully, I feel like the items in the tower are priceless, and giving them a price (be it millions of neopoints) is a bargain to the buyer. About the faeries’ ruin. When do you expect Faerieland to be fully recovered? Oh, in a physical sense, we are already. The buildings and roads in Faerie City are already recovered. However, in a mental state... there are many faeries who still feel insecure. A hatred for Xandra stirs in the air, but I try to dissipate it when I can. After all, she was one of the greatest minds in Neopia. You still believe Xandra can be rehabilitated? Any mind as bright as hers should and can be put to use. Hmm... speaking of Xandra... err... what is it like being a stone statue? *laughs* Is this really important? You could ask any other faerie, but you choose to ask... Fine, I will answer your question. I really had no memory of being made of stone. It was rather like waking up, only to realize that you had forgotten your dream. Although, my skin was surprisingly dry after the spell was reversed. Will Faerieland ever be returned to the skies? Right now, that is almost impossible. However, I’m sure in time we could muster the resources and powers needed to bring it back up. Even if the faeries did have the ability to raise Faerieland into the clouds, I’m not sure we would. The forest is a fine place to live. But now that the faeries are on land, wouldn’t it be easier for Balthazar to cause troubles? Yes, but now that the faeries are on land, wouldn't it be easier for Neopians to free bottled faeries? Just a personal inquiry. How can you be in the Hidden Tower and also about and around Neopia giving faerie quests at the same time? I am the highest of all faeries, the ruler of them all. You think I am bound to one point in space like you, a mere mortal? And now, a more personal question. What is the story behind your pink... uh, purple dress? Ah, I know I will disappoint you by saying the truth--there’s no interesting story. It is simply a... staple of mine now that I have worn it for may years. I have grown rather fond of my look. It brings out my hair and my eyes rather nicely, don’t you think? *interrupting* You could never afford any of them! And they are never for sale. Speaking of selling things, where are my seventeen million neopoints! You did say you wanted to buy a Sword of Lameness! *stuttering* Thank you for your time, Queen Fyora. I found myself wondering what my pets usually do on their Saturdays. 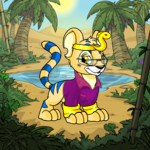 What would it be like to live a day in the life of one of my neopets?